The Lunar Orbiter Image Recovery Project (LOIRP) was started by Dennis Wingo and Keith Cowing in 2008. They obtained the original analog tape drives from lunar missions in the '60s, which were literally covered in dust in a farmer’s barn, and they also got their hands on a complete collection of Lunar Orbiter analog data tapes that held a full set of all images carried back to Earth by the five spacecraft that flew between 1966 and 67. Amazing, historic stuff. But all of these old media formats are fragile, and preservation can be a long and tedious process. Cowing and Wingo funded the archival effort themselves in the beginning, then secured some funding from NASA. But the NASA funding was modest, and has run out; the guys have been funding the project themselves, and they don't have the resources they need. They have exceeded the requirements of NASA’s funding, but just haven't been able to retrieve and digitally archive all of these irreplaceable historic space images—yet. So they're crowdsourcing funds on RocketHub. They've raised about 1/3 of their goal at the time of this blog post, and they have only 5 days left. Miles O'Brien did a "This week in Space" webshow episode about the project back in 2010; check it out above. Below, more on the project from Cowing, who is also the guy behind NASAwatch. The LOIRP team managed to obtain original tape drives from the 1960s (covered in dust in a farmer’s barn) and a full set of original Lunar Orbiter analog data tapes (threatened with erasure) containing all images sent back to Earth by the five spacecraft between 1966-67. None of this had been functional or usable since the late 1960s. From the onset the project has been run on a shoestring budget. The LOIRP effort is housed in an abandoned McDonalds burger joint at Moffett Field, California (also known as "McMoons"). The LOIRP folks used spare parts bought on eBay, discarded government equipment, new hardware reverse-engineered from math equations in 50 year old documentation, modern laptops, the expertise of retired engineers and scientists, and the dedication of young students. Think of this as “Antique Roadshow” meets “The Right Stuff” in an Apple Store. They’ve also called this activity “technoarchaeology” and “dumpster diving for science”. A pirate flag has been displayed in the front window since they started. With this unlikely assembly of people, hardware, and hacking they have been able to retrieve Lunar Orbiter images with far more resolution and dynamic range than was possible in the 1960s. Indeed, many of the images they have retrieved equal or exceed what the Lunar Reconnaissance Orbiter (LRO) is sending back from the Moon today. 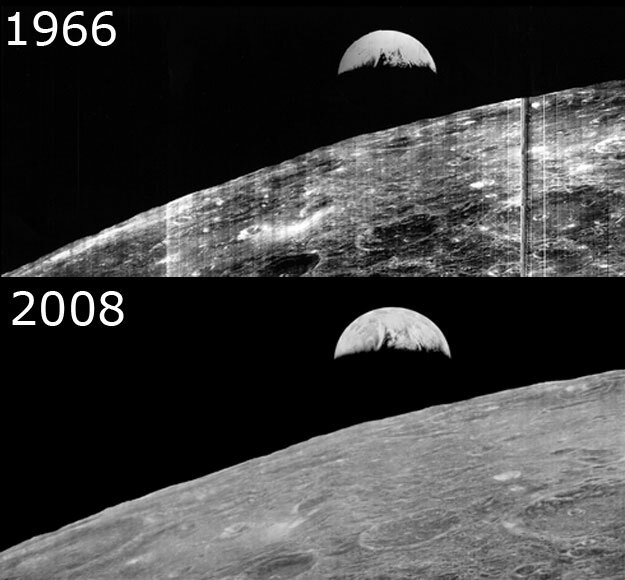 Taken together, this Lunar Orbiter imagery combined with LRO data, provides a time machine of sorts with which researchers can look at recent lunar history. After five years the LOIRP team has optimized their hardware, software, and procedures so as to achieve an efficiency far greater than they initially possessed. In addition to capturing the remaining images, they still need to generate a formal submission of all images to NASA’s Planetary Data System. Three weeks ago we began a crowd funding effort on RocketHub at http://www.rockethub.com/projects/14882-lunar-orbiter-image-recovery-project You will note that among the things we offer to supporters are rare photographs donated to the LOIRP by original Lunar Orbiter program participants specifically for the purpose of fundraising. The fact that we have managed to pull all of this together still surprises us. Many people told us that this was impossible. However, if we stop this project, it is unlikely that this capability can ever be re-created. I would like to thank all the boingboing folks who have so generously donated to our project. We call what we are doing technoarcheology because we are literally digging up our technical past to restore it. It is said that only 1% of the literary works of the Greek and Roman civilizations have made it to us today. I would estimate that out of that 1% only 1% of the engineering and science works have made it to us today. The Greeks were masterful mechanical engineers and the Romans were unsurpassed Civil Engineers. Just think if we had not lost that legacy. This is what our project is all about, preserving the technical legacy of the American technical civilization.